Microsoft stock was up more than 36% in mid-November. Then last week Wall Street chopped 11% from MSFT stock after a mildly disappointing Q2 earnings report. Still, Microsoft stock today, on Nadella's one-year anniversary, remains comfortably in positive territory. 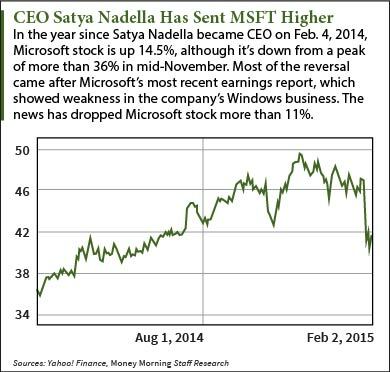 The fact is, Nadella has breathed new life into a moribund company that had lost its way under CEO Steve Ballmer. Under Ballmer's 14-year tenure Microsoft stock became a laggard, with returns consistently lagging the market. 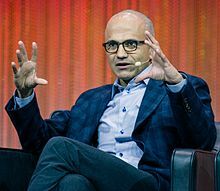 "Under the leadership of Satya Nadella, the company has dramatically changed not only its tune, but its course as well," Box Inc. (NYSE: BOX) Chief Executive Aaron Levie told The Wall Street Journal. "This is a case study in corporate reinvention." Nadella still faces stiff challenges. But in his first year he has shown an ability to break with the Redmond, Wash.-based company's past and test bold approaches. Reason No. 1: Nadella is not Steve Ballmer. Yes, it's obvious. But the contrast between these two CEOs has made a huge difference. Over the years, Ballmer's oafish public image merged with Microsoft's public image – a company that kept tripping over its own feet. Nadella is thoughtful, serious, and seeks cooperation rather than confrontation. And he's a listener. Ballmer lacked respect among his own employees as well as among his peers in Silicon Valley. He was also known for doggedly sticking to strategies even when they were obviously failing. Nadella arrived with a clean slate.